Have you heard about the massive Open House Giveaway? This is an annual event that you will not want to miss. Our new office is once again full of boxes. 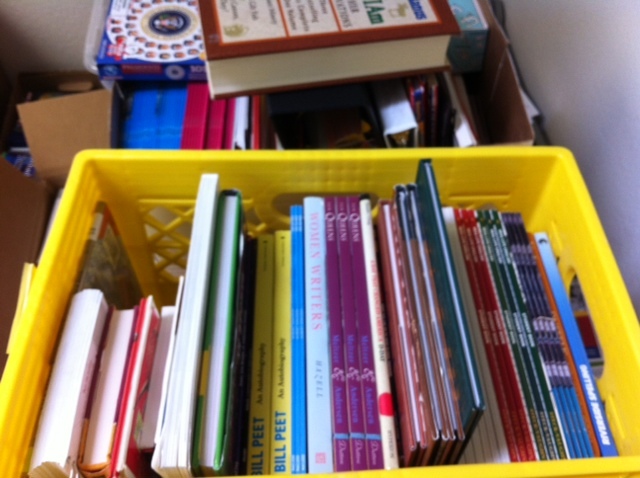 These are not boxes that we will unpack and settle in with; these boxes are full of educational materials and books for all ages looking for a good home. Check out our latest Facebook photo album for an idea of how much and what kinds of materials will be given out. Then imagine how wonderful it will be to spend some time with the Tarrant Literacy Coalition staff and other area literacy providers talking unhurriedly about how things are going and what you would like to see happening. Have I convened you yet? Now it's time to email your RSVP to jbosmans@tarrantlit.org (to make sure we have enough refreshments). Add Open House to your calendar (September 8th from 10-1) and be sure you note our new address: 4750 Benbrook Hwy S., Fort Worth, TX 76116.